Welcome to another week of history and tasty reviews here at brightbeer. If this is your first time visiting me, take a few moments and peruse some of my previous entries to get yourself up to speed, or just open up a savory beer pour yourself a glass and enjoy. Also, I just want to take a quick second to thank those of you who have been reading my blog since the beginning, I really appreciate your support and feedback! So here we go, venturing into the inky black, viscous, and delicious world of Russian Imperial Stouts. I’ll start right off dealing with the name. Thus far I have been dealing with this category of beer by labeling it “Russian Imperial Stout”, but there are a couple of other names that also suit this beer and its many interpretations. Both “Imperial Stout” and “Imperial Russian Stout” are almost always referring to this style of beer. However there are many varieties of stouts (oatmeal, milk, foreign extra, chocolate, and others) which fall into their own separate categories and have different characteristics. 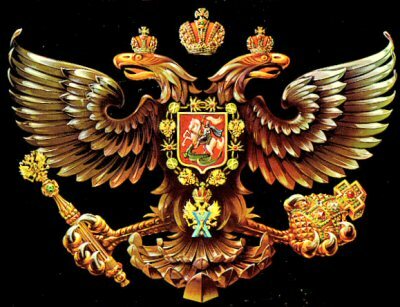 This is the link to the Beer Judge Certification Program (BJCP) official style guideline for the “Russian Imperial Stout” category. If you don’t care to read all of it, or if it goes over your head a bit, let me explain the style’s characteristics in my own words. While each beer will vary dependent on the brewery, some of the general characteristics you can expect from a Russian Imperial Stout are: a dark black (usually totally opaque, meaning you cannot see through it even a little bit) color with a tan to brown thick creamy head; dark chocolate, roast coffee, caramel, and vanilla flavors and aromas (amongst others); and a high level of alcohol ranging from 8-11%. That is skimming the surface for sure, but those are some of the basics for nearly all Russian Imperial Stouts, and surely for the more traditional versions. How did this style come to be? The history of this beer style gets its roots from the Porter style of English beers which were developed during the early 1700s (again, another style of beer which I will cover more in depth in the future). Towards the end of the 18th century, the rise of popularity of Porters coincided with the opening of then Czar ruled Russia to Western countries. Now here is where the available historical information I was able to dig up gets a bit muddled. In one source it is said that Peter-the-Great, the ruler of the Russian empire from 1682-1725 had discovered Porters during a visit to England in 1698. He enjoyed them so much in fact that he requested they be sent back to Russia to serve to his Imperial Court. However, Porters at that time were relatively low in alcohol content and minimally hopped, so the first attempt at shipping resulted in spoiled beer. The historical citation clash I mentioned has to do little with the how the style developed and more with during what time it happened. In a passage coming from pages 141-142 of Garrett Oliver’s The Brewmaster’s Table it is said that Catherine-the-Great, Empress of Russia from 1762-1796, had been the one to discover Porters on a visit to England and request that they be sent to her Imperial Court. Regardless of who is correct (though based on what I have read about the history of the development of Porters, it is likely that Catherine is the one who would have requested the beer sent to her court) the end results are the same. The first attempt to ship Porters more than 1,000 miles across both the North Sea and the Baltic Sea failed because the beer was not well enough preserved with hops or high levels of alcohol. To correct this problem (and to avoid any potential beheadings) the recipe was modified to survive the transport. The level of malt used was highly increased to develop a higher alcohol content, so as to avoid freezing and to be generally less susceptible to infection, and the beer was highly hopped, both to counterbalance the increased sweetness from the malt and to help preserve the beer (remember what we learned about the preservative qualities of hops? See last week’s post if you forgot). The result was a highly robust, well hopped, and strong alcohol beer that could survive for years. This very much pleased Catherine and her court and more was demanded. In a nutshell that is how the Russian Imperial Stout style of beer came to be. Appearance: Jet black and totally opaque. Large, dense, tan head (similar in color to a root beer float) that leaves nice lace down the glass and sticks around for a while. Taste: Bittersweet dark chocolate with some sweet dark berries. Dark roasted coffee is present but light, and some dark caramel with a touch of alcohol in the finish. Mouthfeel: Rich, chewy and silky. Very fine/rich carbonation. The heavy roasted malt flavors give a dry, slightly astringent bitterness that compliments the sweetness of the chocolate and caramel. Overall: Very robust and bittersweet! A great example of the style. I really enjoyed the dark chocolate and berries with the coffee and vanilla/caramel backdrop. Though I could smell and taste the alcohol in the beer it was very subtle and pleasant and served as a reminder that there is still 9% alcohol in this highly drinkable stout. Appearance: Jet black and totally opaque. Frothy brown sugar colored head that slowly subsides to a quarter inch and stays that way for a long time. Taste: Roasted malt with some chocolate fading into some vanilla and caramel. Finishes with some roast coffee bitterness. Mouthfeel: Very rich and velvety. Coats the tongue well with sweet flavors and ends with some lightly astringent bitterness. Overall: I would like to have a fresh version of this beer to compare because while the taste is still very robust and the flavors work well together, the aroma has some noticeable off-aromas that shouldn’t be there. Again I do not think this has to do with the brewing process but with the condition of the aging. Still this is a very sweet and carmelly stout with a slight bitterness and I enjoyed it. Appearance: Jet black and totally opaque. Fairly dense, tall, dark tan head that takes a long time to subside. Aroma: Caramelly dark chocolate with some coffee roast initially and then vanilla before ending with some sprucey (referring to a spruce tree) hops. Mouthfeel: Moderately carbonated, rich and chewy feel on the palate and then finishing with a combination of dry astringency from the heavily roasted malts and bitterness from the noticeable hop additions. Overall: A great, hoppy, imperial stout. Very classic imperial stout flavors of rich dark chocolate, caramel, vanilla and coffee are all just slightly muted from the presence of the hops. The hop aroma and taste also adds another layer of complexity to this already robust beer. In turn, the hops also take on a bright spruce/mint character that I think is brought out by the bitter roastiness of the malt. 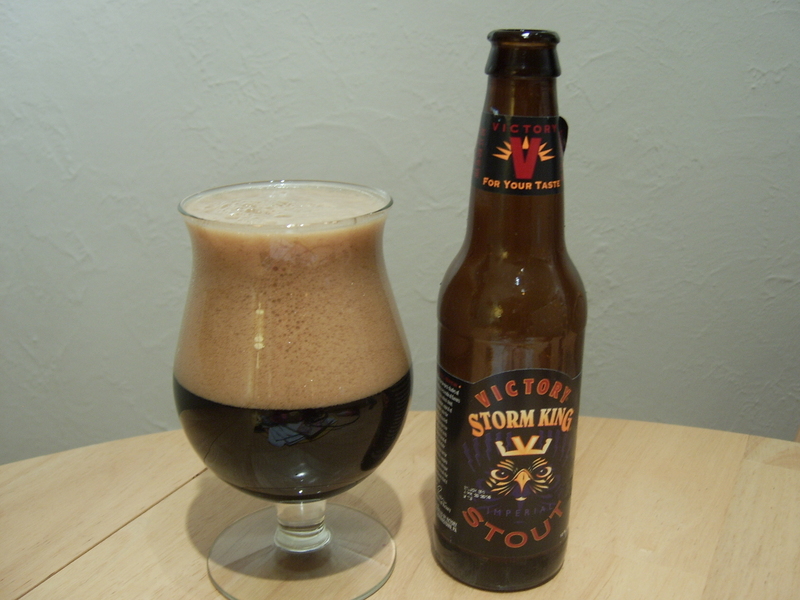 I really enjoyed this beer and it is a great American take on the imperial stout style. Appearance: Jet black and opaque, rich dark brown head that fades somewhat quickly, but lingers well. Aroma: Sweet rich dark chocolate, a bit vinous (wine-like), some lively caramelly vanilla sweetness, a bit of alcohol on the end. Taste: Dark chocolate, sweet caramel, light roast coffee at the end, a bit of alcohol warmth too. Mouthfeel: Rich lively carbonation, full bodied and coats the tongue well with chocolatey sweetness. Overall: Very rich and sweet, very little bitterness or astringency. Highly enjoyable and the alcohol is well hidden so it is quite easy drinking for such a huge robust beer. Really fantastic. Appearance: Black and opaque, very dense tan head that sticks around for a long time. Aroma: Ripe banana and vanilla up front, caramel and a touch of chocolate on the end. Taste: Sweet caramel and ripe banana, then some subtle dark chocolate, vanilla and a very light amount of alcohol on the finish. Mouthfeel: Frothy and soft carbonation, pretty light body for the style and very sweet throughout, no bitterness present. Overall: I was surprised initially by the ripe banana aroma and flavor, but it still worked well with the vanilla and caramel. This is a very drinkable and sweet stout. Appearance: Black and opaque, bubbly tan head that fades fairly quickly. Aroma: Smoky (almost like smoked jerky or meat) dark chocolate with some vanilla and some anise (black licorice) in the background and alcohol is quite present at the end. Taste: Sweet smoky roasted malt with some fresh roasted coffee, a bit of vanilla and anise, and a noticeable alcohol heat on the finish. Mouthfeel: Rich yet bubbly carbonation with a moderately heavy body, sweet throughout and present alcohol heat on the tongue. Overall: A great smoky, robust and potent imperial stout. I like how the smokiness blends with the chocolate/coffee and is finished off with alcohol. It was a great week of tastings and I think my palate needs a night to rest before the weekend. 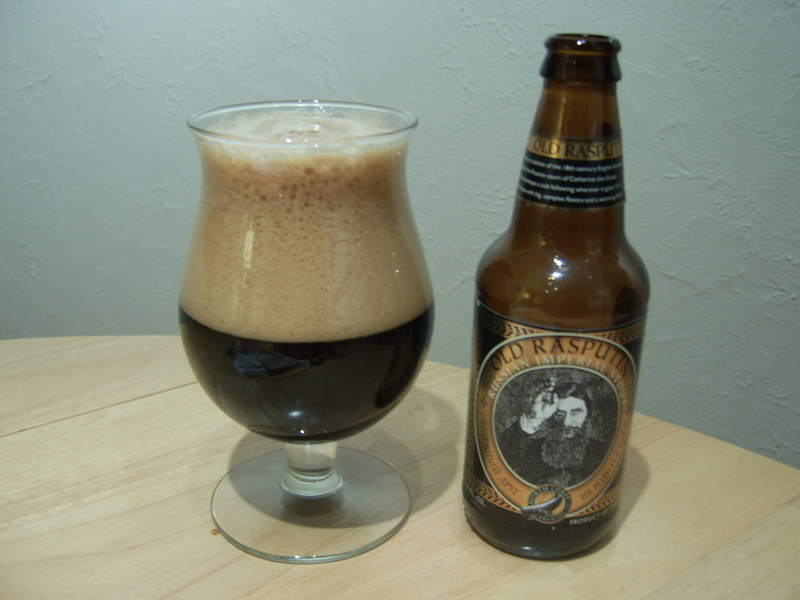 So, of the bunch, my palate picked the Old Rasputin with it’s heavy roastiness balanced out with some dark berries just fitting exactly what I was looking for. The Black Chocolate Stout was also a big favorite of mine, and Ben and I ended up making an Imperial Stout float (you heard me right, we put vanilla ice cream in our beer!) after the samples were done and it was just delicious. I have long heard about making an Imperial Stout float, but hadn’t made one until last night. You should definitely try it, just be sure to pour the beer into the glass first and the more bitter the stout the better (in our opinion, the sweetness of the beer can fight with the sweetness of the ice cream). Well, tomorrow is Darkness Eve and there will be much rejoicing for the impending release of this year’s Surly Darkness. If you’re not busy early this Saturday morning or Friday night, I would recommend checking out Darkness Day. If you can’t make it there, you can find some of the limited release in stores on…wait for it…10/31/11. Yep, Halloween, well played Surly. I have said it before, but this is the most highly anticipated and highly touted beers (rated #54 beer in the world according to ratebeer) released all year in Minnesota, so if you get a chance to try some, you probably should. Hopefully I will be able to procure some in the coming weeks and I will be sure to let you know how it tastes if I do. Looking ahead: Once again I’m not sure at this point exactly what I’ll be writing about, but I have a few options rolling around in my head and I should have something finalized by the end of the weekend, so keep your eyes open. Good luck getting some Darkness, but either way, now you can brag to your friends about how much you know about the abyss in a glass that is the Russian Imperial Stout. Go out and pick some up and let me know what you think. Until next week, drink well! Posted in Styles and tagged beer history, beer reviews, beer style, bjcp, craft beer, imperial stout, russia, surly, surly darkness. Bookmark the permalink. Yeah buddy, I want to go pick up a wet hop beer after your last post. Btw, this is the brewery we’re going to tour when you come down to Chicago. It’s like 4 blocks from my place! A beer float; can’t quite imagine it, though maybe it’s akin to balsamic vinegar on ice cream, which is surprisingly palatable! Excellent history lesson again and good reviews. I think I’ll just sample these dark stouts vicariously. Catherine the Great never visited Britain. Russian Stout wasn’t brewed strong “to survive the journey”. They managed to ship normal-strength Porter to North America and even India. Much longer and more difficult journeys than to St. Petersburg. 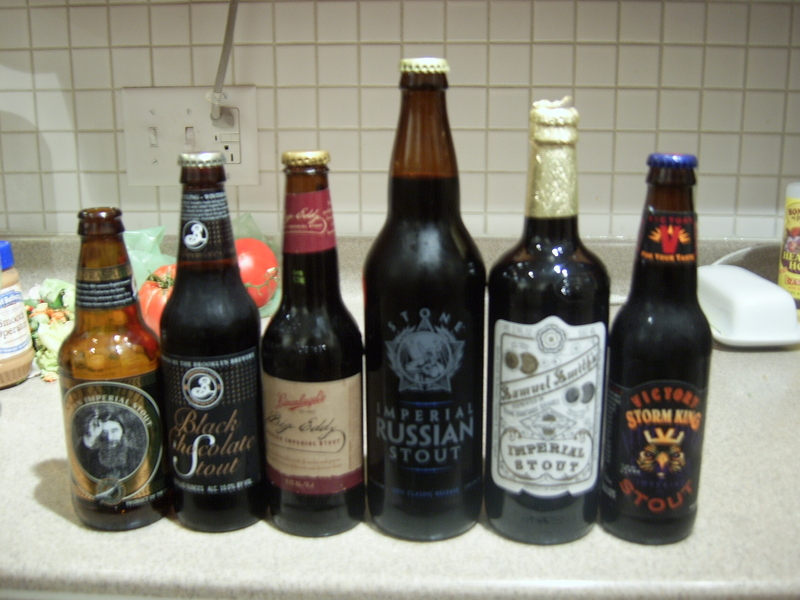 The reason Russian Stout was strong was because it was a top of the range beer designed for a bunch of rich drunks. And the historical debate over the origin of the style continues. Do you have some links, articles or books with more in depth info about the history of Imperial Stouts?